We’ve found that we’re at our best as a church when we’re making a difference in our community and world through hands-on service. We have many opportunities to serve including: weekly Visitation Team that visits shut-ins and delivers meals and tapes of services, Nursery Volunteer, Children’s Church Volunteer, Mission Midway, Women on Mission, Refugee Ministry, Northside Backpack Ministry, Food Pantry, Feeding the Hungry, ESL program and other opportunities. and their 5 children, natives of The Congo, arrived after spending 20 years in resettlement camps to their freshly appointed apartment. 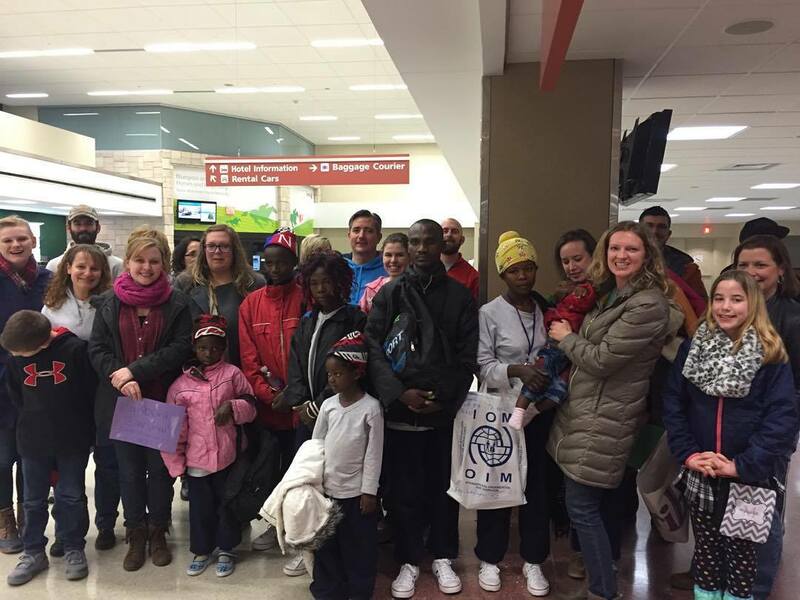 Seen here at the airport they were greeted by members of our Refugee Ministry Team. If you are interested in joining this group, contact team leader Haley Wyatt. Midway Baptist Church has a long history of being Mission oriented. Many of the newer members of our family, like myself, have heard stories of Touching Miami with Love and the trip to Chile. Even through a couple of stints where we had interim leadership; God lead MBC through mission work by guiding us to Mission Midway, Booneville and others. At the present, we are in the midst of what I believe is the beginning of a long, meaningful relationship with the people of Haiti. At our core, we are a mission oriented church family. At every turn, at every junction, at every obstacle…MBC has shown itself as a home for Children and Missions. This is what God has and is leading us to be. At our recent Children’s led service, Andrea highlighted the welcoming and fun atmosphere we provide that draws in children. How that we are able to use fun as a way to educate our children and teach them the love and grace conveyed by Jesus. Andrea used the example of a slide on the playground. How when you’re a small child that the slide is so exciting, yet so scary at the top…and how as parents we know that the child will have fun, will be safe… and ultimately will want to do it again…if we can only get them to take that first leap of FAITH and go down the slide. Our children trust us when we tell them it is safe to slide, yet that first time is still a difficult test. What a great metaphor! How many of you are at the top of that slide right now? How many of you are ready and willing to take that leap of faith and serve God in the mission field? You know that you trust God and that he knows what is best for you. But sitting there at the top of the slide is scary, isn’t it. Maybe, just maybe, what you’re scared of is how much fun you will have… or how much it will change you…or how much that you will want to do it again, and again and again. I get that. I’m certainly a different person now than I was before I went down that slide. I’m not finished in Haiti…because God is not finished with me in Haiti. Andrea perfectly stated our hope for every child that walks through the doors, that they would know Jesus as their personal savior. I encourage you to take that leap of faith, to slide down the proverbial slide, to accept God’s call for whatever mission He is leading you to do. For one thing is certain, our children will follow where we lead them…let us lead them along the path that God provides.